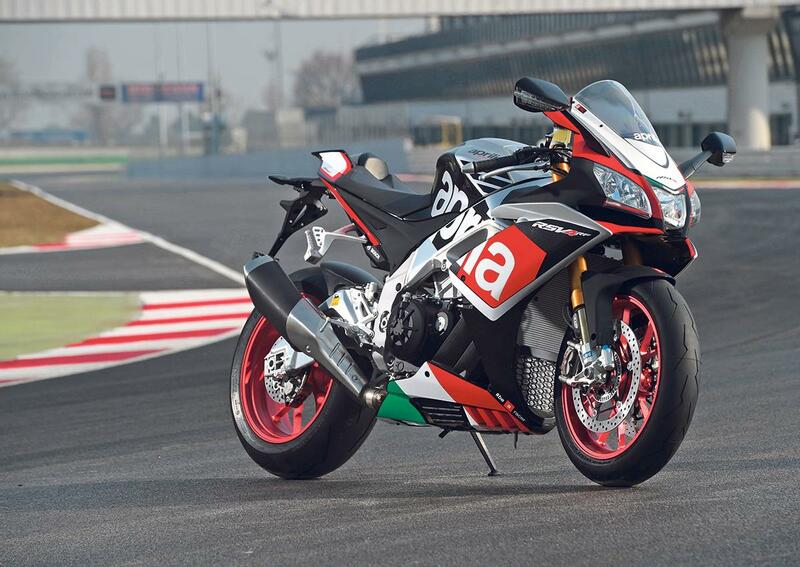 Aprilia has joined the 200bhp club with style. Like the previous model the RSV4 RF is incredibly easy to ride fast, thanks to its even lighter, more accurate handling, tweaked electronics and flexible V4 power. 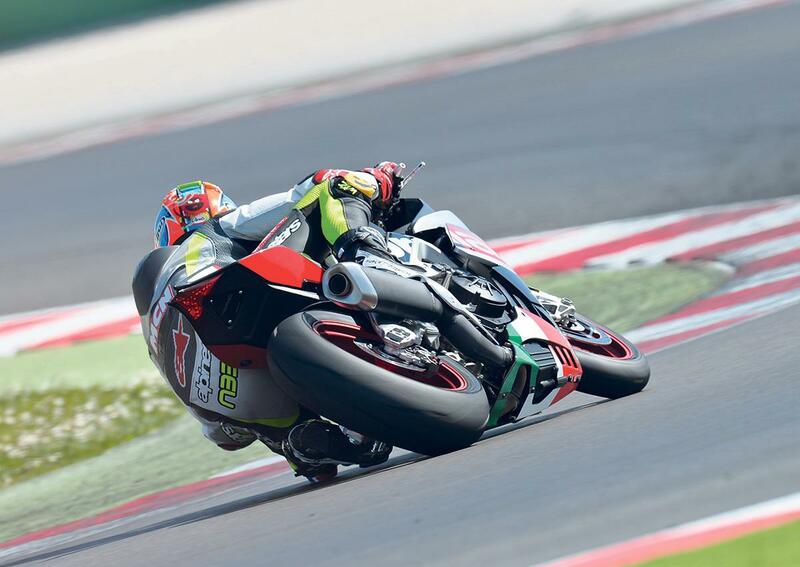 But with its new engine mods it now has the muscle to compete with the superbike class of 2015. Although the previous RSV4 was down on power compared to its rivals it handled so well, it hardly mattered. So it’s more tweaks than big changes in the chassis department to control the extra power. 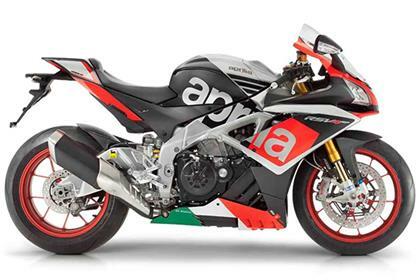 Aprilia has used its existing adjustable twin spar aluminium frame to jiggle the engine and steering position and drop the centre of gravity, reduce trail and improve agility. A 4mm longer swingarm improves rear grip and helps stability. Steering is light through fast flip-flops and trail braking into slow corners. 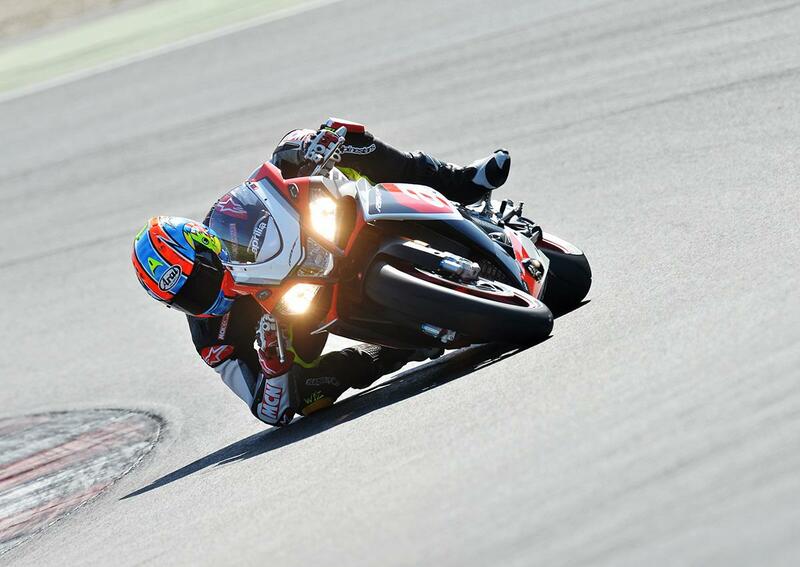 It’s easy to hold a line at high speed and there’s racebike levels of feel through the chassis, suspension and tyres. All this gives you the confidence to bury it on its ear in corners. Brembo monoblocs offer unrivalled feel and power. Although designed to win superbike and superstock races, the new RSV4 RF should be more practical on the road. The new-design mirrors are wider, the clip-ons set higher and the upper fairing, which has 1.5kg lighter headlights, is more aerodynamic. 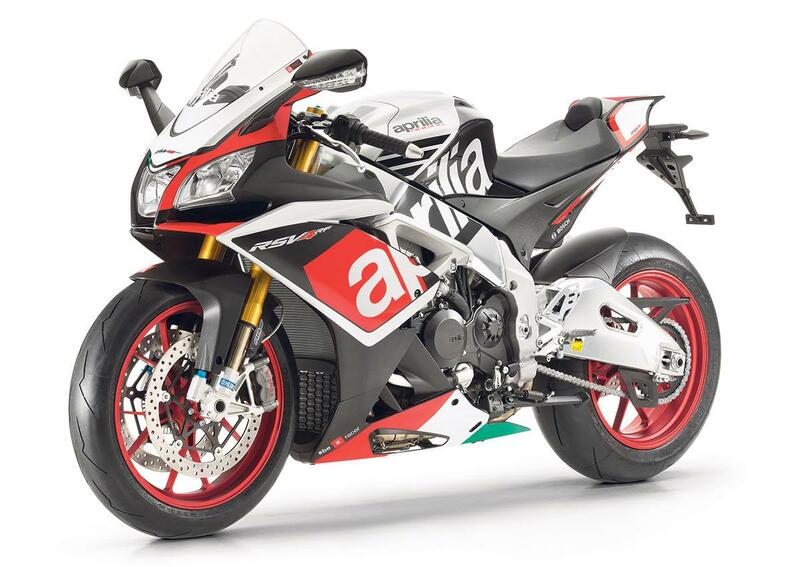 Aprilia claims 201bhp@13,000rpm (up 16bhp) and 85ftlb of torque from its redesigned harder-revving, 2.5kg lighter 65° V4 engine. A new cylinder head has revised porting, a CNC-machined combustion chamber, new titanium exhaust valves and 1mm-larger titanium inlet valves. It has 100g-lighter Pankl conrods, new crankcases, cams and a lighter gearbox with revised ratios. There’s also a new airbox with a vertical air filter, redesigned variable length inlet trumpets, a new exhaust with 2mm-larger diameter header pipes and a new lubrication system. Where the old RSV4 would run out of puff around 12,000rpm, this new version keeps on pulling hard to 13,500rpm and hammers straights as quick as its rivals. But it’s not all about top end power. The V4 motor has a silkier throttle than ever and flatter, easier to mange spread of torque. It’s beautifully built, using top components and goes like stink. 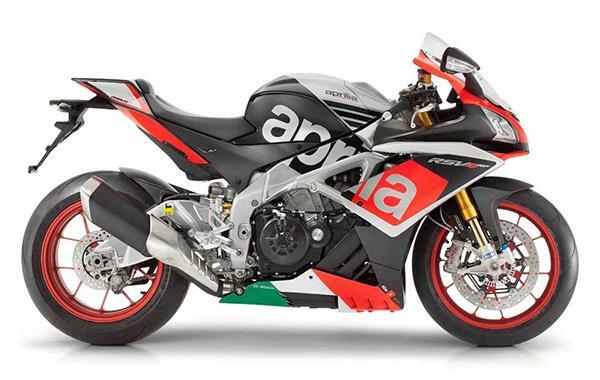 But for some strange reason many see Aprilia ownership as a risk, don’t connect with the brand, or haven’t got a dealer nearby. Aprilia had a poor reputation for spares back-up over a decade ago, but that’s a thing of the past and these bikes are generally bulletproof, won’t let you down and aren’t hard to live with. It’s pricier than the standard R1 and S1000RR Sport, but cheaper than the R1M, 1299 Panigale S and Panigale R. You get a lot of technology, speed and handling for your money, not to mention that howling V4 soundtrack. It has lightweight forged aluminium wheels, and fully adjustable Ohlins forks, shock and steering damper and ‘Superpole’ graphics. You also get Brembo radial monoblocs, a polished aluminium frame and swingarm that wouldn’t look out of place at an art gallery and sticky Pirelli Diablo Super Corsa SP trackday tyres, with a 200-section rear. The RSV4 RF has a more refined racing ABS system, traction, launch and wheelie control, a quickshifter and three riding modes (Sport, Track, Race). New electronics control engine-braking parameters, depending on the gear position, so there’s less chance of rear wheel ‘hop’ in the lower gears. In ‘Race’ mode the engine braking is reduced below 6000rpm. The only electronic gizmo missing from the new RSV4 RF is an auto-blipper. But the Aprilia comes with the option of a datalogger, smartly packaged as a phone/tablet app (see annotations). It talks to the bike’s GPS and shows you real-time laps, displaying things like your speed, throttle position, lean angle and traction/wheelie control intervention, once you’ve finished your ride. You can also see where you’re gaining and losing time, lap-on-lap. The app also lets you set your wheelie and traction control corner-by-corner. Front suspension 43mm USD Ohlins forks, fully-adjustable. Front brake 2 x 320mm discs with four-piston Brembo calipers. 2009: RSV4 Factory introduced. No APRC electronic rider aids at this point. 2011: Factory Special Edition ‘Biaggi replica’ (only 350 produced) is first RSV4 to come with APRC, a dual display road/race dash, an improved cooling system, revised gearbox ratios and a 200-section rear tyre. 2012: Production Factory upgraded with Special Edition electronics and mechanicals.2013: Larger 18.5-litre fuel tank (up 1.5-litres), ABS, new exhaust can with larger pipe, reduced engine friction and improved electronics. 2015: Heavily-modified engine producing 201bhp. Refined electronics with revised engine braking control, 4mm longer swingarm, revised geometry, new mirrors and top fairing, higher-set clip-ons, 1.5kg lighter headlights. Lower-spec RR version not being brought into the UK. 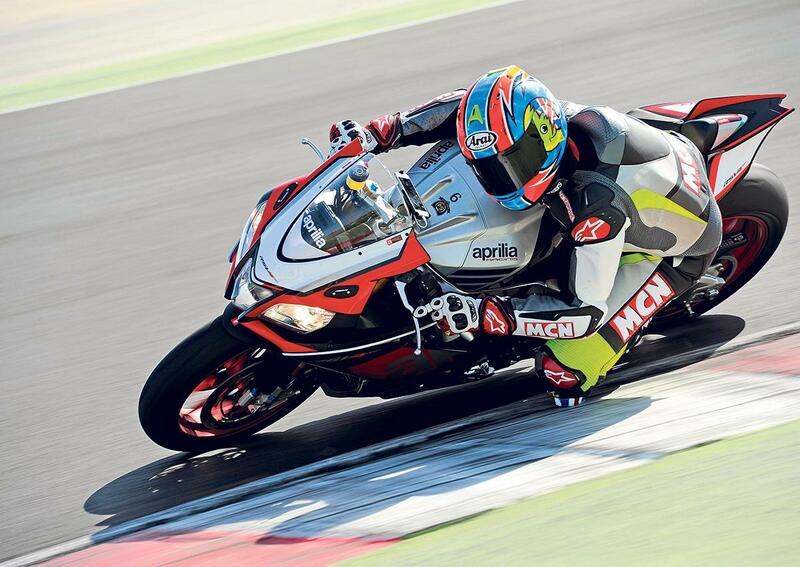 3 owners have reviewed their APRILIA RSV4 RF (2015-on) and rated it in a number of areas. Read what they have to say and what they like and dislike about the bike below. Fantastic handling and ride experience. Awesome sound. That's the best part. Great torque throughout the range and adjustable engine breaking and the sound is fantastic. It has pretty much everything you could want. The quick shifter only works on upwards gear changes but practically this is not a problem. Very confidence inspiring, in fact out of the box its the best bike I have ridden (believe me I have ridden a lot). I looked at other bikes especially R1M, the RSV4 RF is better as out of the box it does everything very well plus you can buy them now (no wait) and most importantly it feels special when riding unlike boring japanese bikes. Raced an S1000RR 2015 in Assen and felt it was very road based bike whilst the chassis on the RSV4 is pure race you get soo much more feed back. The ride is firm but supple at the same time. The speed that can be carried over bumpy moorland roads is incredible if you carry your weight on the pegs rather than the seat. The sound of the V4 is glorious, the power delivery below 10k rpm really smooth and flexible. Top gear roll on at 70mph is fierce. At 10k rpm the bike goes mental and becomes a brute. Just what the doctor ordered. Its too new to know yet, just 1600 miles old. However, my 10 year old RSV Mille Factory is still looking good, so that bodes well. Have no idea yet of servicing costs, depends on miles covered. It is a pricey bit of kit, but the spiritual successor to the RC30 was always going to be. Of surprise is the rate of front tyre wear. I don't think it will make 2000 road miles, but the rear will easily. Its a sports bike, and the performance stuff is all there. The electronic toys do what they say on the tin. We all get stuck doing motorway miles, and in average speed camera areas it hates sitting at 50mph, wondering around quite a bit. Cruise control may not sound like a sports bike requirement, but it would make the drudgery of motorway riding more pleasant. Bought from a franchise dealer, and the experience of this one was fine. The RS250 I bought from them at the same time is a different story.